For your brand values and taglines, translate them into the native language and consult a local expert to see if any of them need changing. Sometimes, just a small tweak in wording will make all the difference. The next set of phrases to focus on is your brand’s own vocabulary. You may need to modify your English one to accommodate non-native speakers. Are there any current terms you use that could confuse people? Do you include pop culture references that not everyone has access to? The easiest adjustments to do are to shorten your sentences and check your reading levels. Long and compound sentences are difficult for everyone. You want your messages to be as clear as possible. Lay’s acquired Walkers Potato Crisps in the UK in 1989. They rebranded it then into Lay’s colors but kept the Walkers name for brand loyalty. The two maintain separate social media accounts for their respective regional audiences. Use your current strategy as a blueprint for other countries, languages and cultures. If you plan on having a strong presence or separate account for them, each one deserves its own approach. This sounds like a lot of work but it’ll pay off in the long run. Take time to research cultural events, taboos and marketing approaches. Listening is your best beginning strategy. Observe what others in the country or language are doing and how people respond. For example, Twitter might not be the social media of choice in some countries. In China, Weibo is one of the more popular networks and would require someone knowledgeable about it to handle its communications. When deciding to add to your team, use native speakers and local experts, especially if your strategy relies heavily on connecting to your audience. Finally, research local laws. With the GDPR policy taking effect in Europe in 2018, many brands have taken a second look at their data collection and privacy notices. Depending on which country you’re operating in, laws may prohibit you from posting specific types of content. Let’s get this out of the way first: you don’t need multiple profiles to run a successful global brand. The ability to run profiles is directly influenced by your budget. If you’re a team of one or two, then multiple profiles might be a challenge. But if you’re a team of ten, then that certainly presents itself with more management opportunities. 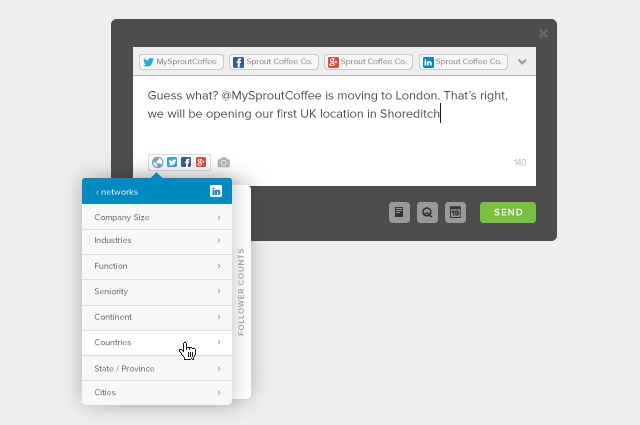 If you have a small team and you’re sticking with one profile, try writing targeted messages by location. On Facebook, enable multiple languages so you can write one post in different languages. This prevents you from having to post the same link three times. Alternatively, you can target your posts to a different audience. In Spanish, you might limit the locations to Spanish-speaking countries. If you have the resources, think about how you want to divide up your accounts. Larger companies like Nike, divide up by country, product, target audiences and even campaigns. You can also divide up by language if that’s how your company is aligned. Think carefully on how you want to build up your social media team. Who will handle what? What cultures do they specialize in? Are they dialed into the regions that they Tweet from? All of these are important questions to consider. At the same time, you’ll likely still have products and guidelines that apply globally. How will you keep everyone up to date and on the same page? Use an internal communications tool like Bambu or Slack to keep staff on track and to curate content from around the world. 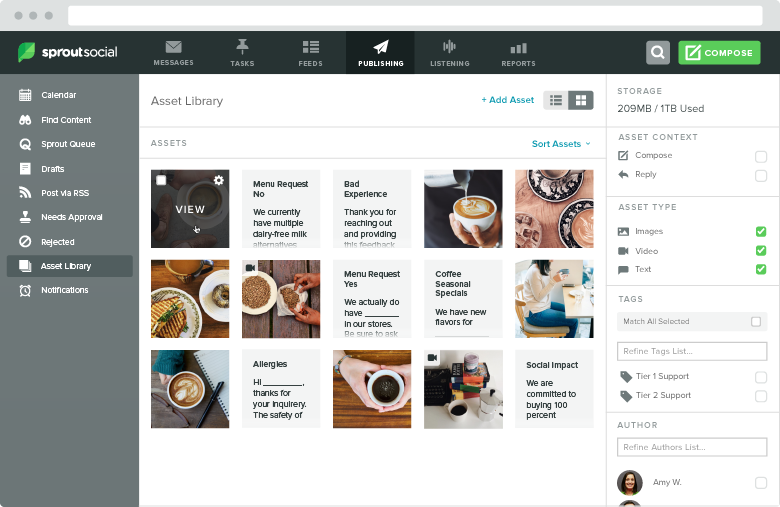 In addition to a global meeting, include an easy-to-access asset library like the one Sprout has available. With this feature, you can store media and text for a more consistent branding experience in all of your accounts. 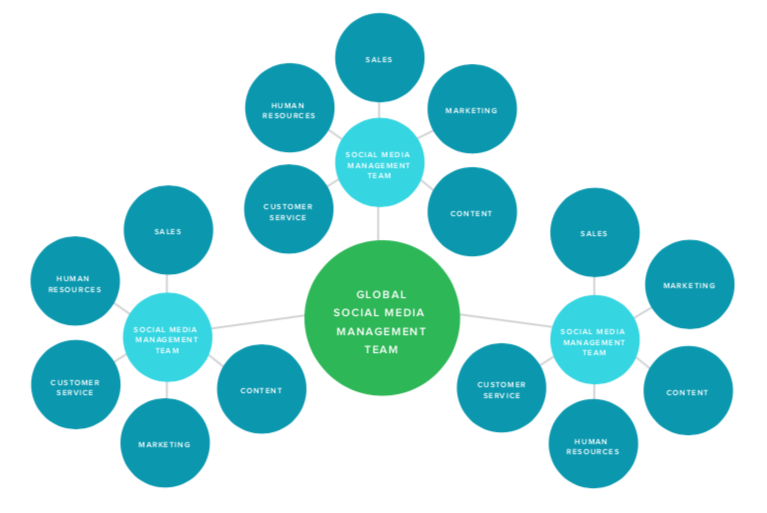 There are many ways to insert a social media team into your company. Do accounts operate independently? Will there be any oversight from the global corporate office? Do the team leads of each country or product have input on global strategy? In Sprout’s free ebook on structuring a social business team for enterprise companies, the dandelion model is featured as a potential global organization. With this type of structure, the separate teams can more or less function independently with a little oversight. However, this structure can also lend itself to too much independence, which leads to brand dilution and confusing communication. To work around this, find an enterprise social media tool that blends with your internal communication and team structure. 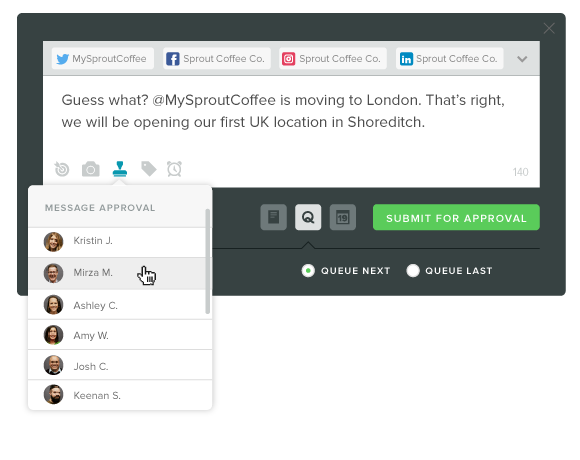 Sprout’s enterprise model allows for groups to be created with multiple social media profiles, permissions set at the user level and unlimited reporting so you always know how your brand is doing. With all the planning and strategizing done, it’s time to execute your strategy. But how? Hopefully the planning work you put into place involved a team structure and management tool. Here are a few tips to keep in mind while you’re executing. Your most active audience might be in the US but if you’re building up an audience in Germany, you’ll need to target them at the right times. If you’re operating with a single account, add in local times and messaging to your post schedule. Hyatt keeps a global brand account that Tweets out coverage from all their locations around the world. Their individual locations will Tweet in native languages and sometimes in English. Because travelers come from all over the world, incorporating some English into their accounts makes sense. The biggest perk of managing in the same time zone that your audience is awake in is that you can keep track of news as it happens. Any local breaking news has the chance to become global. But if you’re tracking it as it breaks, your other accounts have more time to get ahead of it or even pause the posting schedule. Holidays are also a major consideration for global brands. For example, Father’s Day is not the same day globally. Wishing a happy Father’s Day from your global account might not make sense if the audience is not celebrating it on the same day. A local sporting event might force a reschedule in one account’s posts while a large event like the World Cup would impact multiple accounts. Emojis may not always be used the same way across borders but some emotions remain the same. Stories that talk about overcoming challenges or elicit an emotional response ring strong in marketing. Everyone still wants to be part of a group, so influencer marketing will work no matter where you are. The only difference might lie in the execution. Disney’s stories of overcoming adversity crosses cultural barriers. It’s one of the many reasons why the brand has won over audiences for so long. If you’re on a limited budget, find stories that will appeal on an emotional level. Storytelling elements like videography and photography can aid in this. If 85% of Facebook videos are watched without sound, then this type of content should already be on your mind. Finally, looking at your analytics could not be more important. You need to look not just at the individual account levels but also at the global, overall level. Collectively, is your brand getting a clear message across? This is where Sprout’s group report shines. 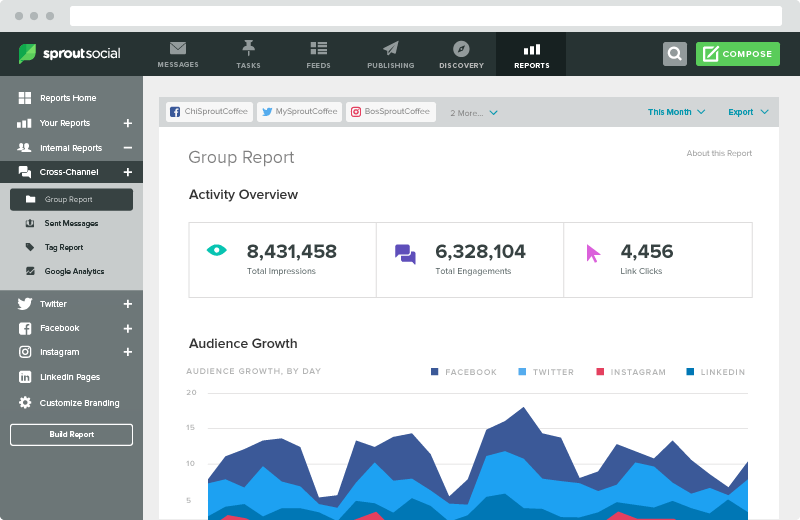 Combine all of the accounts into one group to pull the analytics report. Or, divide the groups up by region and see how your European accounts are performing against your North American ones. These high-level reports will advise your strategy. Maybe Twitter wasn’t as strong as you expected it would be in Japan. Noting how active the audience is with numbers to back them up will let you make an informed and strategic change in your focus. Global brand management on social media can be tricky. But with the right team structure, plan and communication tool, you can set yourself up for success.